Dr. Edlis earned his PhD in Clinical Psychology from the University of Tennessee Knoxville in 2008, following an internship at Harvard Medical School/Cambridge Hospital in Boston. He came to the University of Tennessee to pursue his doctoral training after completing his Master's degree in Clinical Psychology from Tel-Aviv University, and with the passion to further deepen his conceptual and clinical training in psychoanalytic psychotherapy as well as psychological assessment/testing. In his work at the university, Dr. Edlis teaches both at the undergraduate and doctoral level, revolving themes such as personality development and functioning, psychopathology, clinical supervision, and psychological assessment/testing. 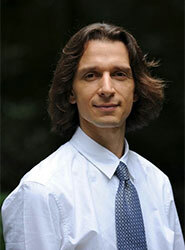 In addition to his work at the university, Dr. Edlis has been in private practice in Knoxville since 2008. Dr. Edlis' core model of the mind and theoretical orientation is psychoanalytic/psychodynamic, while integrating a developmental psychopathology empirical foundation to his understanding of character formation, development, and functioning. His clinical training emphasized long-term individual psychotherapy with adults, as well as psychological assessment/testing with both adults and adolescents.